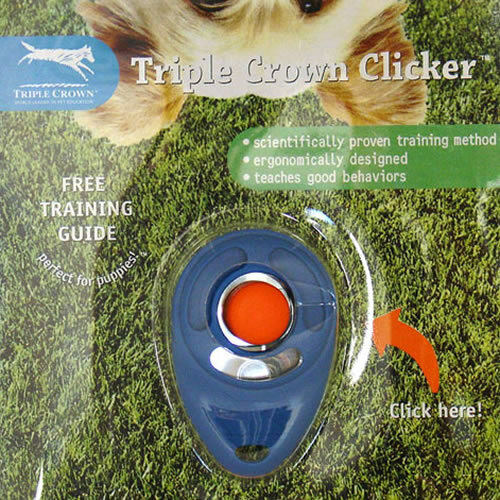 Using the Star Mark Clicker is an easy and fun way to shape and reward positive behaviors in your dog. It is based on the scientific principles of Classical conditioning and Operant conditioning, and its ergonomic design makes it comfortable to use. For more information on how to use the Star Mark Clicker, read the step-by-step training guide that comes with the Clicker. I love this clicker and the advice that came with it. My dog is responding very well, and I wish I'd tried this kind of training before. She is nearly 12, so that just proves they are never too old to learn something new and important. I am using it for sit/stay commands, mainly to get her attention to stop her barking when people visit. I now have had success with this where noting else worked before. I highly recommend clicker training for a dog of any age, and this one fits nicely in the hand and is easy to use. Thanks again, waggle, for helping my dogs in many different situations. Read 5 customer reviews of StarMark Clicker. The average customer rating is 5. I am happy with the Star Mark clickers I purchased. They are strong and have a nice sharp sound when clicked. From the photo I wasn't sure if they would feel comfortable in the hand, but I was pleasantly surprised when they arrived. Postage was prompt and arrived in perfect condition. I professionally train dogs and puppies, and I use the clicker with great results as I'm then able to help the owners to carry on with their training from where I have left off. Great training product, thanks StarMark Clicker :) My puppy responds really well when I use it.